The Kelvin TOP-SET system is a straightforward and user-friendly incident investigation system which is scalable for all levels and types of incidents – from minor, non-lost-time incidents such as slips, trips and falls to major catastrophic incidents such as oil spills and explosions. This step-by-step process provides a reliable investigation structure which includes planning, investigating, analysis, creation of recommendations and reporting. Open thinking and information gathering without bias (i.e. divergent thinking) are encouraged in order to seek out quality data to analyse and report on. 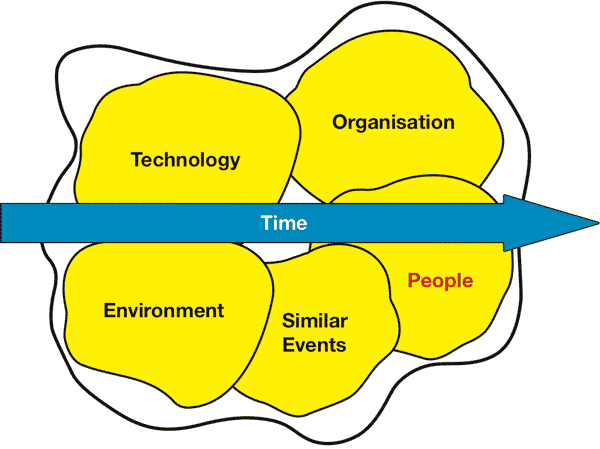 Rather than focusing on Root Cause Analysis as a box ticking exercise, TOP-SET gives users the confidence and competence to investigate any type/scale of incident in any industry – from slips, trips and falls to major process failures by leading them through the full and straightforward investigation process. The TOP-SET method is not only efficient and effective, it is an incredibly user-friendly tool. 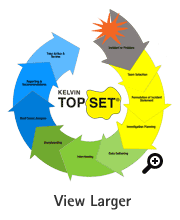 The Kelvin TOP-SET system uses a set of indicators, which are commonly found in incidents, as a thinking framework which can be used during the investigation process. 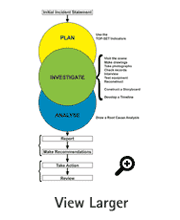 A detailed planning chart containing around 400 indicators, which fall under the TOP-SET headers, is used to guide investigators through the planning stage in a simple and effective manner. It is this focus on a standardised approach to planning and structuring investigations that gives TOP-SET investigations their accuracy and consistency. Kelvin TOP-SET provides a comprehensive range of products and services that includes 3-Day Senior Investigator and 1-Day Investigator courses, Tutor Development, investigation support, software, publications, and materials for conducting investigations. 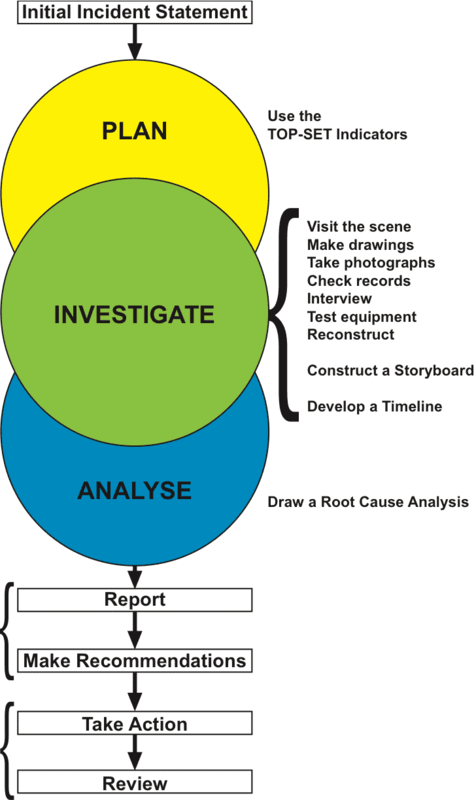 Each TOP-SET course helps delegates to quickly become highly proficient incident investigators by focussing first on creating an accurate incident statement and then spending time selecting the incident investigation team and planning the investigation before going on to gather data, create a storyboard and timeline of the incident and then conduct a root cause analysis. Working in small groups and tackling complex case studies, course delegates gain new skills and confidence as incident investigators in an open learning environment. Experienced tutors guide delegates through the investigation process and ensure that ample time is spent getting to grips with good investigation and root cause analysis techniques. After the root cause analysis is completed, time is spent focussing on the need for consistent report writing and how to create and follow up implementable SMART actions. The TOP-SET incident investigation system is primarily paper-based which encourages effective team work and also eliminates the worry of any IT related problems when operating in harsh environments or at an incident site. The system is supported by a range of paper-based and software based tools which allow for effective collation of incident data. The system is generally seen to be the most comprehensive and user-friendly Incident Investigation System available. 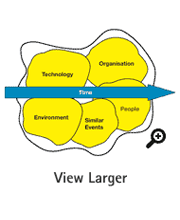 The process ensures that all information avenues are explored and that ‘nothing is missed’ prior to investigators thinking about analysing the information. This saves time and reduces the likelihood of investigators having to re-investigate matters missed when proper planning is omitted. The TOP-SET system ensures that consistent and accurate recommendations and reports are created. Kelvin TOP-SET’s simple approach to incident investigation and root cause analysis allows users to communicate with ‘one common language’ across cultural boundaries. See Clients, Countries and Sectors for more information. 8) Prevent incidents from happening again. 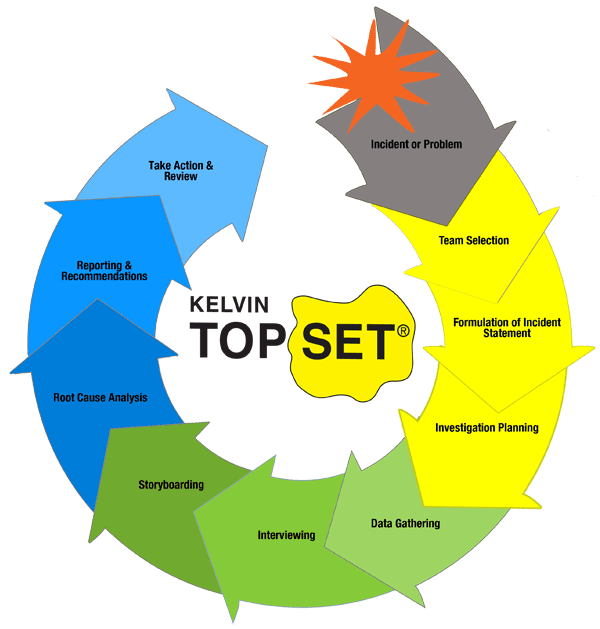 Kelvin TOP-SET can help you and your team to investigate incidents, address complex problems and process failures and to learn from incidents to prevent them from happening again. Find out more about how the Kelvin TOP-SET Incident Investigation System can improve your organisation’s safety performance, decrease the likelihood of incident recurrence and increase overall corporate profitability.